There’s a simple way of appealing to late-night anime fans – get a pretty girl to act in ways that are just like a male otaku. “Look – she’s so cute! And she’s doing all the things I do!” Well, it worked for Lucky Star. 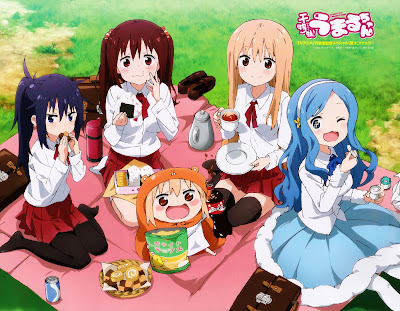 Umaru-chan neatly filled my ‘brainless fun with a bit too much fanservice’ void. There’s very little substance here, but there’s not really mean to be. A young salaryman called Taihei lives in his small Tokyo apartment with his schoolgirl sister. Outwardly, she is the perfect student – model-pretty, academically top of the class, and highly skilled at any sport she turns her hand to. At home, however, she is a terrible slob who loves anime, games and surfing the net – while eating sugary snacks and chugging cola. She seems callous to her brother sometimes, but is actually devoted to him, and of course has a variety of pretty friends with extreme character quirks that always involve blushing, who all also become very interested in Taihei. The usual boxes get ticked – beach trips, Valentine’s chocolate dilemmas, sweet Christmas eve fuzziness. Umaru-chan also takes part in video game tournaments, goes to nostalgic old stores and pontificates on the best way to snack. The key is not to follow the formula too closely, or like Umaru-san, you get a show that’s pleasant and enjoyable but leaves very little lasting impression.